Tissue Procurement: Human cartilage tissue is collected from cadaveric donors within 48 hours of death or as surgical specimens from a relevant procedure. The tissue is harvested from the knee joint from both clinically “healthy, normal” donors and from those diagnosed with rheumatoid and osteoarthritis. Proper consent and serological information is obtained on all specimens. 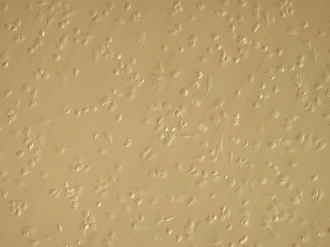 Monolayer Culture: Primary chondrocytes are seeded onto a flask or multi-well plate in media supplemented with 10% FBS. The cells are maintained in a humidified incubator at 37oC and 5% CO2 for a minimum of 48 hours to promote cell adhesion and then shipped with cold packs for overnight delivery. The standard seeding density is 25,000 cells/cm2. Quality Control: Tested negative for fungal and bacterial contamination. Copyright © 2013-2019 Articular Engineering. All rights reserved.